If you're Slash you wear it any way you want . 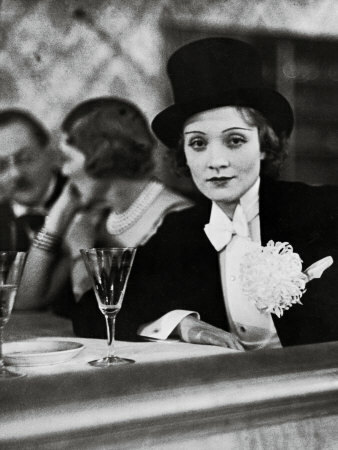 . .
And few could do it as offhandedly as Dietrich . . .
1) Keep the rest of your outfit monochrome--the black/white/grey range looks best. 2) While the swallowtail lines of a tux or tailsuit jacket are classic partners to a top hat, it's a tough look to carry off unless the fit is flawless and you're superconfident in your own skin. A sequined blazer is easier to find and more forgiving. A sleeveless satin halter could also be amazing. 2) Stay away from military stylings (brass buttons, epaulets) unless it's a costume party with you as ringmaster. 3) Counter the angular lines of the hat with flowing hair (version above right preferable to version at top). Or, do as Marlene does, affix a big blown flower or feather pin at the lapel. 4) You can lightly embellish the hat to soften it up . . . consider adding band of anthracite velvet, or pin on a black silk flower, or even a skinny rhinestone belt wrapped a couple times around the brim . . .
5) Do seek out a quality hat (of felt or fur) and be sure it fits perfectly. If it rubs or slides around within the first few minutes, you'll find it completely unwearable an hour later. See here for more top-hat icons . . . I love that black hat and again thanks for posting that video.